It will happen at some point. That beloved, trusty couch that got you through college keggers, early learning stages of your marriage and the sticky hands of your first child, has seen it’s final days. You are ready to approach the next stage of life with a new piece of furniture better suited to carry the weight of the future. But, with various discolorations, fruit punch stains, tears and a loose spring or two, how exactly do you retire your old pal? First off, if the couch isn’t a safety hazard, ask friends and relatives if they, or anyone they know, might need it. There is always a college kid or someone who just embarked into the world on their own that may not have the dough for a new piece of furniture and isn’t too picky. That old couch can provide a few more memories for someone else’s new beginning. If no one you know wants Old Faithful, consider donating it. Again, the couch should be usable and not a health hazard in order to donate to someone in need. Thrift shops like Salvation Army and Goodwill can pick your items up for FREE if they are in decent enough shape. Habitat for Humanity has a ReStore that will also pick up appliances, toilets and other items of that nature. Use your best judgement. If your couch has had its last hurrah and shouldn’t be donated, use the other options listed below. Contact your local garbage provider/waste management service to see if they would consider picking up an item as large as a couch. You might get lucky and they will tell you just to toss it next to your garbage cans on trash collection day. Some companies will pick it up for free while others might pick it up but charge you an additional fee. This will depend on the region in which you live but that might cost you an additional $50 – $75. You may be required to put a special tag on it that may only cost $10 or something of that nature. 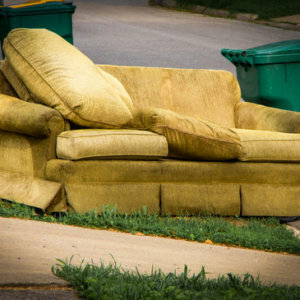 Your couch will go straight to a landfill so if you care about the environment, this might not be the best option for you. When a company refuses to pick up the larger items, you can try your luck with putting it on the curb for garbage pickers. Many times they will come around and take it off of your hands for you. If it doesn’t get picked up in a couple of days, you will need to dispose of it in another way so you don’t incur the wraith of your village and get fined for having it clutter up the curb for too long. Craigslist is one of the greatest inventions of our modern time. You can list just about anything in the “FREE” section and someone will find a use for it. It doesn’t matter how old or disgusting your item might be, the adage “one man’s trash is another man’s treasure” makes its home on Craigslist. This works exceptionally well if you live close to a metropolis or urban area. Because the item is free, you may have a few no-shows and miscommunication but don’t despair. There should be enough people that you’ll get the one who does finally show. Some folks put a small price on the items to weed out the lookie-loos and get more serious inquiries but it all depends on how fast you want it to move. If you have a couch on its last legs, don’t list it for $50. Put $1 or $5 on it and get it out of your hair. Also take into consideration that these individuals will have to come pick up the heavy item and may need a moment to get help or a vehicle that can haul it. If your item is fairly new or in amazing shape, you can even put a decent price on it and try to make a few bucks. Aside from Craigslist, you can try Facebook Marketplace, Facebook Groups devoted to Garage Sales or Free Items, apps like LetGo, OfferUp, Etc., garage sale sites like Bookoo or even your local community paper and town hall/recreation center community board. If you recently purchased a new couch, your furniture store might take the old one for FREE. Many times the delivery guys can haul it away for you when they bring your new furniture. Check with the company before you buy and inquire if they might do this for you. If not, ask the delivery guys themselves. They might haul it out for some cash. Sometimes it might seem easier to haul that old couch to the dump yourself. Brace yourself though, landfills and dumps will charge you to drop off that bulky item. You may have to pay per piece, per pound or both so don’t be surprised. Some folks have paid $100 or more to drop off the old couch. You also have to factor in that you need the proper vehicle to load your couch and that your nearest dump station might be a little further than anticipated. If you live 50 miles from the nearest town and drive a VW Bug, you might be in trouble. Another factor to consider about this option is that your couch will just end up piled in the landfill. Around 9.8 million tons of furniture end up in landfills every year, which not only takes up precious space we have in those dumps, but is not good for our environment. A junk removal service or dumpster rental company should have no problem taking those large pieces of furniture off of your hands. If you tell them you want it recycled, they will do their very best to ensure that as much that can be recycled, WILL be. 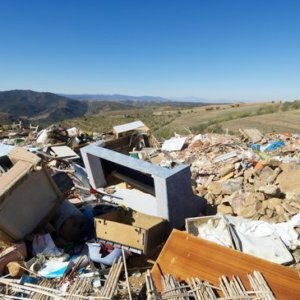 With junk removal, they can pick up one piece if needed while a small dumpster can hold quite a few pieces of furniture. Again, talk with the company representative about recycling options prior to scheduling service. This option might be more costly than what you can spend to remove the couch so you may want to exhaust the other options first before revisiting this. It may be hard to get rid of that couch that carries a lot of memories and emotions for you but, at some point, that piece of furniture could become a hazard to you, your children and your pets. There are many options when it comes to removing your old couch and you should consider what would be best for you regarding time, effort and intent. When all is said and done, your old pal could be recycled into new furniture or given to someone in need. The point is to not be discouraged if the avenue you chose to go with doesn’t pan out and to try your luck with another direction. Need To Clear Out That Old Furniture And Get Started On A Fresh Path? Grab a Dumpster Rental in Burr Ridge today! One of the most important factors in reducing accidents and costly damages is to find the perfect placement for your dumpster rental.